Is Swimming During Pregnancy Safe? Home » Pregnancy » Health » Is Swimming During Pregnancy Safe? An activity that allows you to move when you are pregnant, even when you feel like it is difficult to be mobile – swimming. As most are familiar with the sensation of weightlessness from being in the water, pregnant women are able to not only enjoy this but also benefit from it as well. 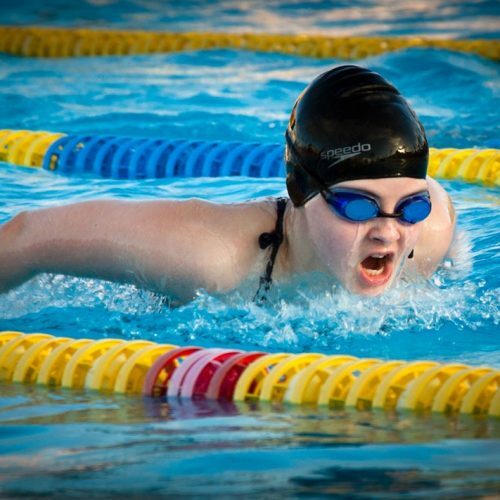 Swimming gets the blood pumping which improves your overall circulation. When you are pregnant, you may begin to feel restricted in both circulation and movement. Combined with its low impact intensity, swimming can be suitable for any expecting mother at any point during the pregnancy. It goes without saying that you must be extra careful during any physical activity while pregnant. Exiting and entering the pool can be tedious and slippery, so make sure that you have proper footwear and help from the railings. Listen to your body; some days you will be able to swim longer than others. If you are feeling easily strained, make sure you are taking enough breaks. Generally, it is recommended that you swim for 20-30 minutes at a time. However, if you have been swimming long before pregnancy, your endurance levels might surpass this recommendation. Try not to hold your break, because your baby will be deprived of oxygen. Breathe continuously and calmly during your swims. While being in the water, it can also be very easy to forget to stay hydrated. Make sure that you are allowing yourself plenty of fluids before and after your swims. This is especially important during the hot summer months when the risk of dehydration is prominent. Where there is a pool, there is also normally a hot tub. It is not recommended to soak inside of a hot tub while pregnant due to the severity of the temperature. Spending over 10 minutes in a hot tub can lead you to feverish symptoms and is speculated to lead to potential complications such as miscarriage or brain abnormalities. It is likely that no matter where you live, you will have easy access to a pool. If you do not have one at home or in your apartment complex, most gyms and recreation centers have pools for independent use. If you want to take a water aerobics class, there are also opportunities to do so. As you get farther into your pregnancy, you are going to want to do activities that require the least amount of stress or effort. Because swimming is so gentle, it has the potential to be effective without you even realizing it. As you move through the water, your body will refrain from overheating, even while doing exercise. Think of the water as a blanket of support that is holding you up. With your muscles being supported, there is no risk of strain or being overworked. When you swim, you are counteracting back strain by floating freely in the water. The buoyancy is a great pain reliever and has the ability to put your body back into proper alignment. Due to the increasing growth of a pregnant belly, it is normal for your posture to become more curved and your pelvis to become tilted. It is a great all-around body workout because you are able to use large muscle groups simultaneously, such as your arms and legs. You do not have to worry about strain or struggle because the water automatically ensures that the workout is going to be gentle. Some also use swimming as their go-to exercise after the pregnancy. It’s a great way to ease the pains and strains that came alongside the pregnancy such as those who suffer from back pain after an epidural. It is foolish to count calories when you are expecting but is it understandable that you may still want to stay in the best shape as possible. When thinking about your weight during pregnancy, it is important to stay realistic. The amount of weight you gain when you are pregnant generally follows your BMI (body mass index). Those who maintain an average BMI of about 21 tend to gain around 30lbs. Of course, this greatly varies due to many factors such as genetics, pre-existing conditions, and more. Using swimming to not only maintain your physical fitness during pregnancy but also prior to it, will prevent you from gaining an excessive amount of weight. Swimming is an easy way to burn calories, and as it was mentioned, a low impact choice of exercise. When you are between 1-6 months pregnant, try to swim first thing in the morning. This will relieve your symptoms of morning sickness and get you energized for the day ahead. You can use props such as a noodle or kickboard to keep the exercise low key and fun. If you find the chlorine smell to be triggering to your nausea, see if you have access to a saltwater pool. You can even opt for natural bodies of water like the ocean or a lake, if possible. It is advised to consult your doctor before swimming in a natural body of water due to the risk of possible bacteria. You will want to make sure that comfort is a priority as you continue swimming late into your pregnancy. Trying out different strokes could help to alleviate the struggle. At this point, your belly will have probably outgrown your swimsuits, so looking into maternity options might be necessary. To keep your neck level and support, you can utilize a snorkel. Sometimes, your muscles are going to feel sore or tight, so it is recommended that you walk around in the shallow end of the pool. This will still allow you the buoyant feeling of being in the water, but with much less strain. If you would like to add a bit more resistance, you can move your arms while you walk, as if you were swimming. You can also use a paddle board to help support your upper body if you would like to kick your legs freely.